If this email message is not displaying correctly, it will display properly for you on this web page. JUST ANNOUNCED!!! 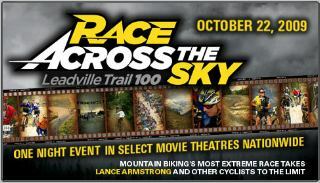 You can win tickets to the screening of the new feature film "Race Across the Sky" featuring Lance Armstrong! "Race Across the Sky" is a documentary covering the 2009 Leadville 100 bike race, one of the most intense endurance races of all time. Hear candid conversations with Lance Armstrong, Chris Carmichael, Dave Wiens, and other elite and amateur cyclists. Watch this riveting adventure unfold as riders overcome extreme challenges to participate in this grueling race! EXCLUSIVE for CORBA! : The first five people to register online on OCTOBER 1st on Pay Pal for the 2009 CORBA Fat Tire Fest and join CORBA as a new member, will receive a pair of tickets to the screening of "Race Across the Sky" Thursday October 22nd at 8 pm at the Bridge Theater at 6081 Center Dr., Los Angeles CA 90045 in the Howard Hughes Center . YOU CAN WIN!!! Just register with Pay Pal on October 1. Please also send your email and phone number to: ftf@corbamtb.com or 818-206-8213 so we can get your winning tickets to you for the screening on Oct 22nd! We have set up an account with Twitter to help keep people informed of the lastest developments in our trail advocacy, recreational rides and trailwork days. Follow us on Twitter at twitter.com/CORBAmtb. Join or Renew your membership today on our membership web page. Join Our Team! Do you have any ideas about mountain biking recreation in the L.A. region? Would you like to apply your skills and manage projects that contribute to the sport and lifestyle that you love? Is there an advocate in you? We are recruiting motivated individuals who work well with others. Send an email to info@corbamtb.com or come to a monthly Members Meeting to find out more about what we do and how you can help. Check the calendar for the next meeting. Please do not reply to this email as the corbanews mailbox is not monitored by people. To contact CORBA, email to info@corbamtb.com or visit our 'Contact Us' page for other addresses.